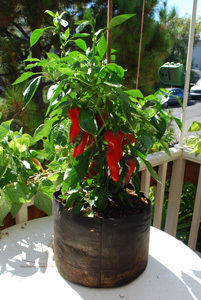 Pepper varieties can be divided broadly into sweet peppers and hot peppers, or chiles. I’ve listed some favorite sweet peppers below. 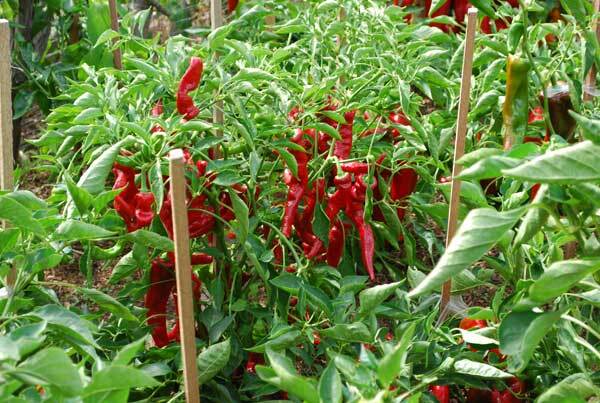 See hot pepper varieties for recommendations on their hotter cousins. Sweet peppers range from the familiar bell pepper to sweet, thick-walled pimiento peppers, to Italian ‘corno di toro’ (bull’s horn) peppers. Green peppers are sweet peppers that have been harvested green, before ripening. 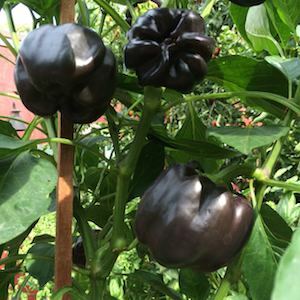 Most bell peppers turn red on ripening, but there are also yellow, orange, white, purple, and even chocolate-colored cultivars. 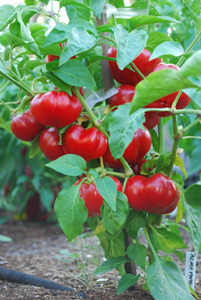 As the fruit ripens, it loses some of the bitter flavors of green peppers and becomes sweeter and much more nutritious. 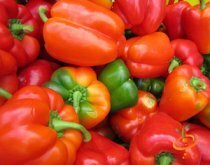 The bright pigments in peppers are not only beautiful, they’re part of the reason these fine vegetables are so good for you. Each pigment is an important phytochemical that helps protect cells from damage. 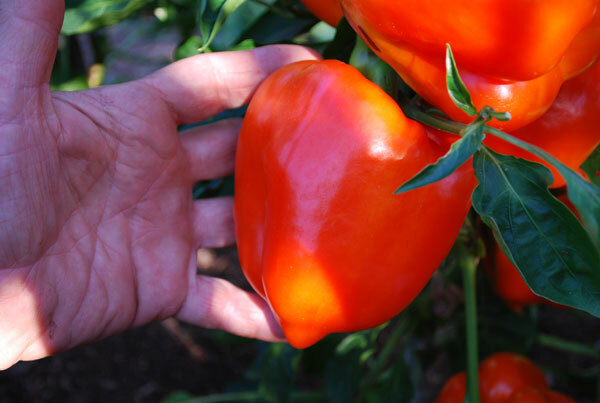 ‘Olympus’ (F1, 85 days) is a red bell pepper that really lives up to its name! These peppers grow huge, and they're sweet and delicious at red ripe. Good leaf cover helps protect fruit from sunscald, and this variety performs well in both hot- and- cool-summer gardens. Resistant to Bacterial Leafspot races 1-3. 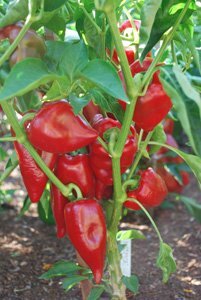 ‘Vidi’ (F1 hybrid, 65-70 days green, 85-90 days deep red) is a thick-walled, succulent European red bell pepper that’s sure to be a favorite. I’ve grown them for 15 years, they’re the best for roasting and stuffing. 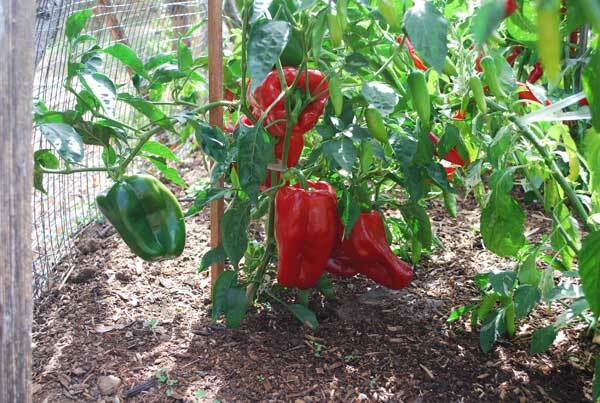 Each plant produces 4-8 large, heavy peppers. 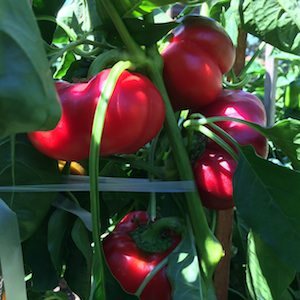 ‘California Wonder’ (Heirloom, Open Pollinated, 55 days green, 70 days bright red) produces heavy yields of 4-lobed, thick-walled bells that are perfect for roasting, grilling, and stuffing. 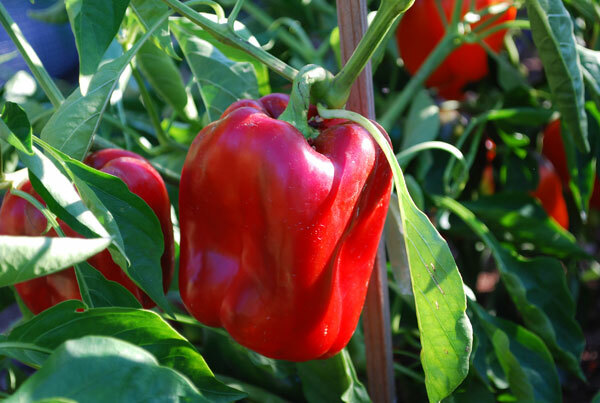 This early bell pepper produces well in cool-summer and northern gardens. 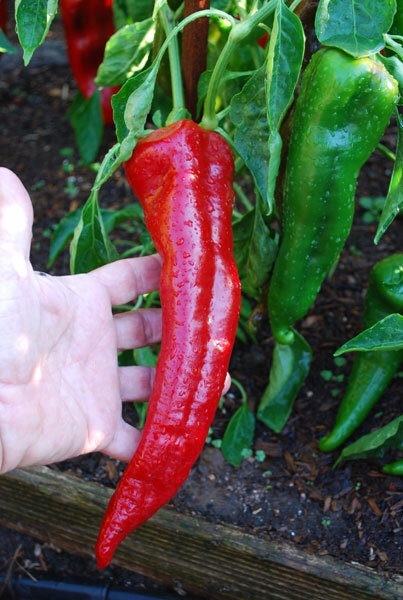 ‘Yolo Wonder’ (Heirloom, 80 days) is probably one of the most frequently seen green pepper varieties in supermarkets. Very productive plants with good leaf cover to reduce sun scald. 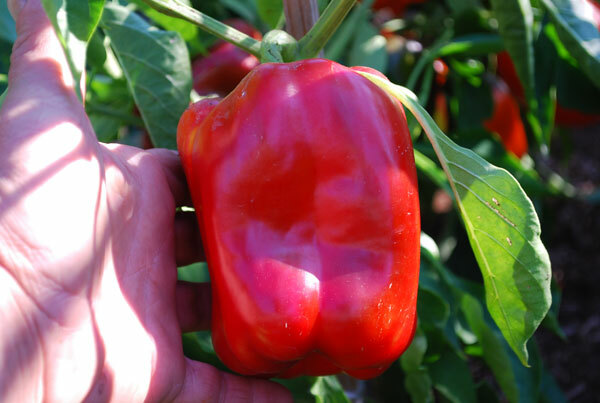 ‘Ace’ (F1 hybrid, 50 days green, 70 days bright red) is a very early bell pepper that produces heavy yields of medium-sized bell peppers. 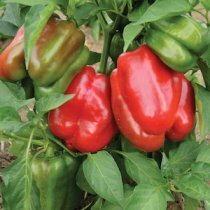 If you’re growing bell peppers in northern or alpine short-summer gardens, this is one of the best pepper varieties for you. ‘Staddon's Select' (F1 Hybrid, 70 days green, 80 days red) is another great early red bell pepper that produces even in cool- or- short-summer gardens. ‘Gourmet’ (Open pollinated, 85 days, resistant to Tobacco Mosaic Virus) is one of the best orange bell peppers I’ve grown. 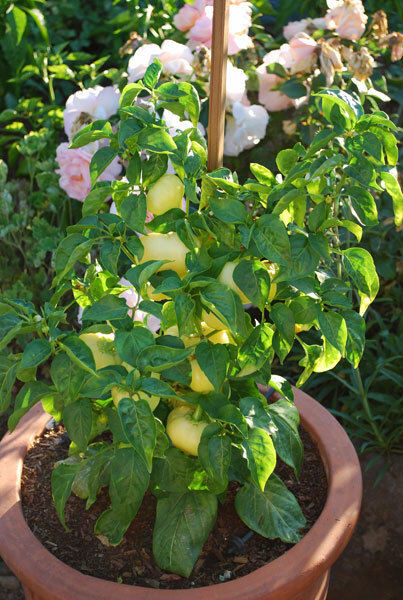 It produces 6-12 sweet, thick-walled, elongated orange bell peppers. Sets fruit early enough to color up before frost. 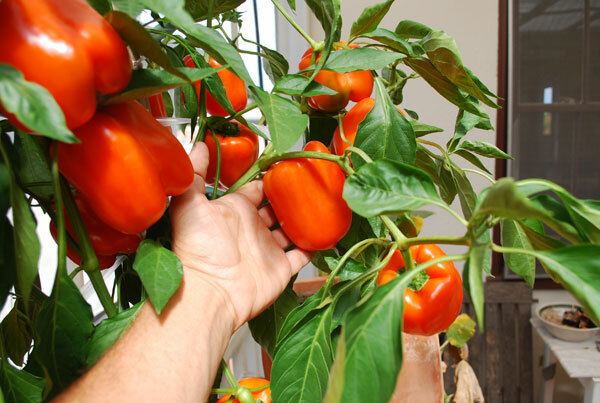 ‘Horizon Orange’ (Heirloom, Open Pollinated, 75 days) produces lots of medium-sized, orange sweet bell peppers. Excellent container pepper for a warm balcony. ‘Valencia’ (F1, 85 days) produces brilliant orange, 4-5” (10-13cm) thick-walled bell peppers that are delicious grilled, roasted, or stir-fried. Adds a bright color cut in thin slivers and added to slaws. 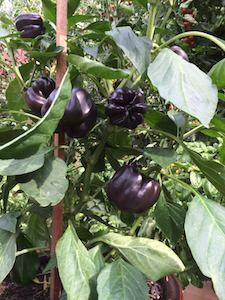 ‘Purple Beauty’ (70 days) produces 3" x 3" (7 x 7 cm) blocky peppers that go from green to purple. Hotter weather tends to produce a deeper purple color, while cooler weather produces a lighter purple pepper. ‘Sun Bright’ (Heirloom, Open Pollinated, 70 days) produces bright yellow bell peppers that are excellent grilled, stuffed, or sliced onto vegetable platters. ‘Chocolate Bell’ (Heirloom, Open Pollinated, 80 days) produces deep chocolate-brown bell peppers that are excellent stuffed or sliced. 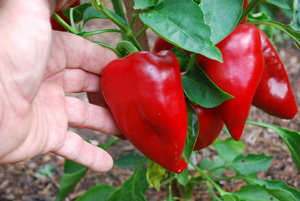 Pimiento Peppers are thick-walled, heavy, and sweet. 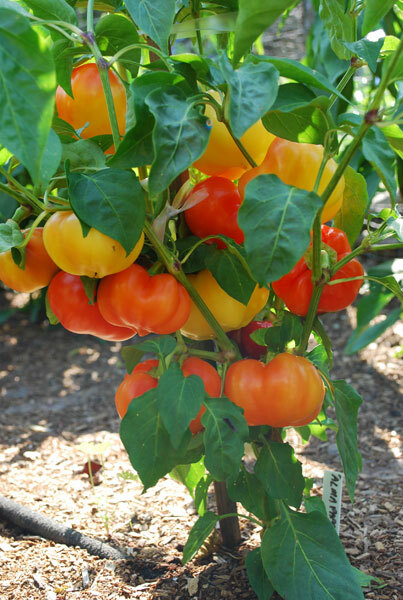 They need a long, hot summer spreading into fall to develop their full flavor and characteristic sweetness. 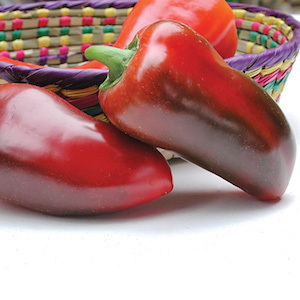 'Peqillo' ('Little Beak') peppers are a classic pimiento pepper. 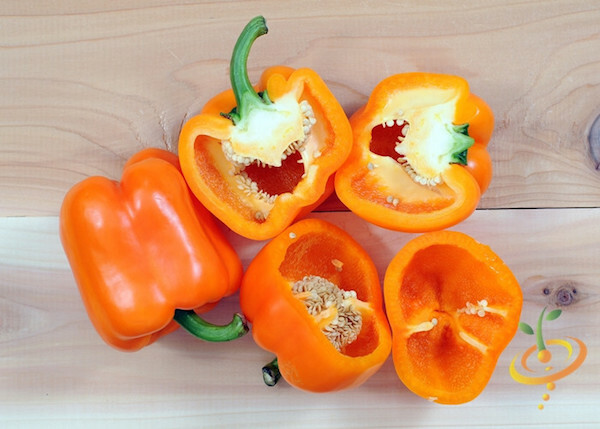 With a slight citrus edge to balance their sweetness and just a kiss of heat, they're wonderful roasted and served with a drizzle of olive oil, roasted garlic, and a splash of sherry vinegar, the standard Basque treatment for their native peppers. 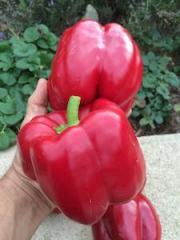 Pimiento peppers don't get as large as many bell peppers, but they're denser and much heavier for their size. 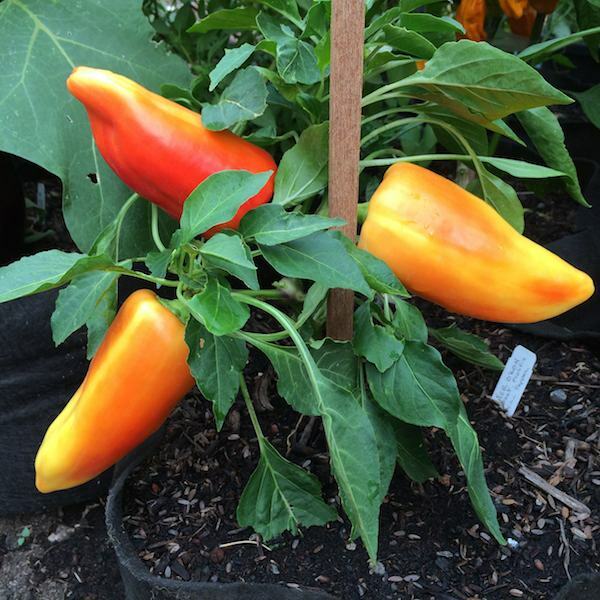 They can have pointy tips, like 'Pequillo' or 'Lipstick' peppers, or be rounded on the bottom, like 'Alma' paprika peppers or 'Sheepnose' cheese peppers. Blunt-bottomed pimiento peppers make excellent stuffing peppers, since their flat bottoms make them more stable in a roasting pan. 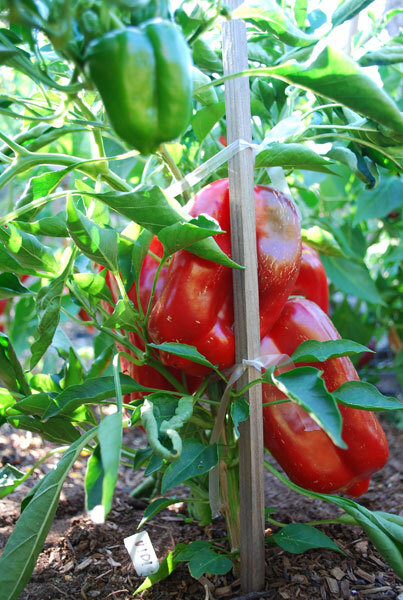 ‘Pequillo’ (Open pollinated, 85 days) 'Peqillo' ('Little Beak') peppers are a classic pimiento pepper. In October, you'll smell them roasting over beechwood fires in the fall. Sweet with a slight tartness and a kiss of heat, there's nothing quite like them. 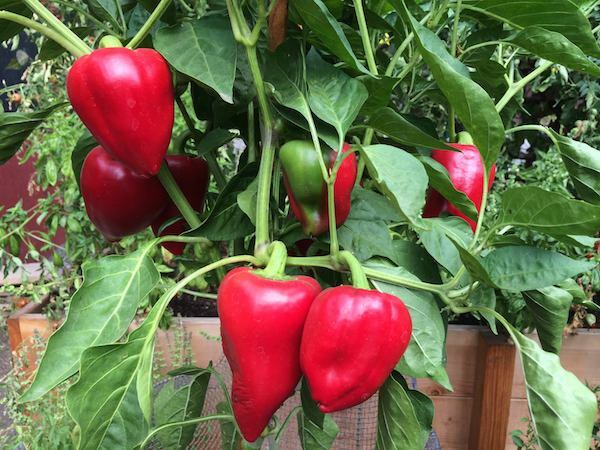 ‘Lipstick’ (F1 hybrid, 53 days to green, 73 days to red ripe) produces 4” long, thick-walled, blunt-nosed peppers that are delicious raw in salads, sautéed, or roasted. Reliable, early producers even in cool-summer gardens. 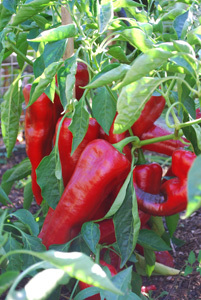 ‘Pizza’ Peppers (F1 hybrid, 55 days to green, 80 days to red ripe) produce 4” long, blunt-nosed peppers that are very thick-walled and have a hint of heat. 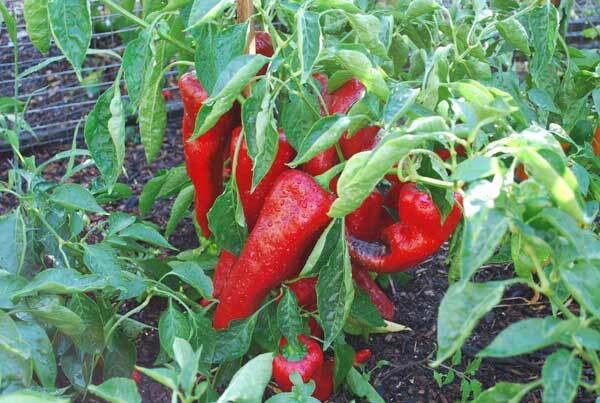 Perfect for crunchy slices of green or red pepper on pizzas. We grow these every year for all our pizza-loving clients. 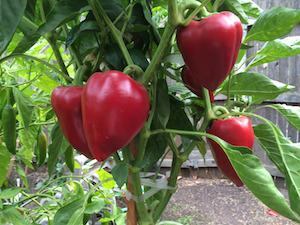 ‘Sheepnose’ (Ohio heirloom, 70 days) produces thick-walled, heavy, sweet peppers that store for a long time in the refrigerator--if they last that long. Also called 'Sheepnose Cheese' because it's a superior stuffing pepper. 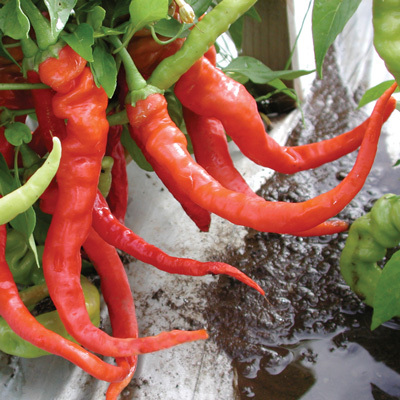 Produces even in northern or cool-summer gardens. 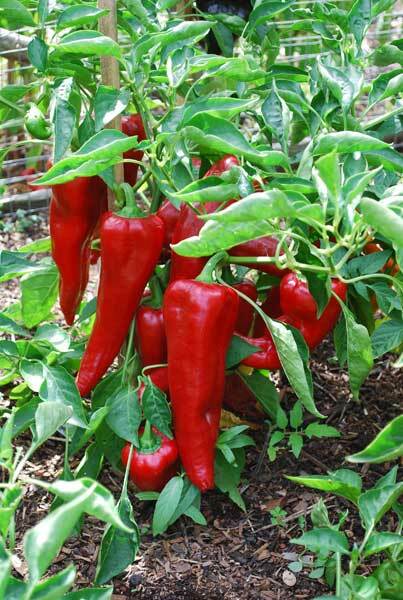 Paprika Peppers are red peppers that are dried and ground to make paprika, the classic Hungarian pepper spice. Often the peppers are smoked before drying to add an extra layer of flavor. Paprika peppers sometimes have a little bit of heat, in addition to their sweetness. 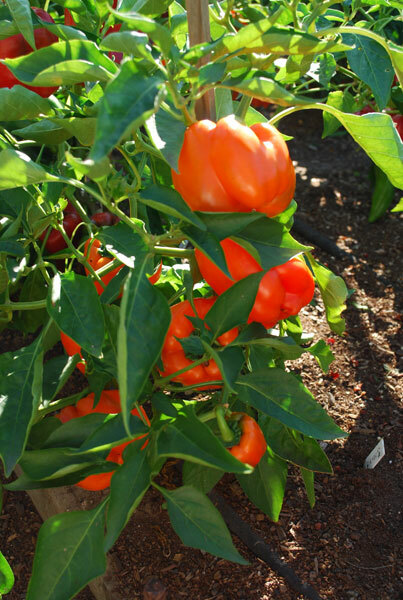 ‘Alma Paprika’ (Open pollinated, 80 days) is the pepper to grow if you want to make your own paprika. The blocky, heavy, 1-2” (2-5cm) fruit start out white, turn orange, and ripen to a deep red. The thick walls are sweet, but the ribs hold some heat. Harvest red, dry, and grind to make unbelievably flavorful paprika. 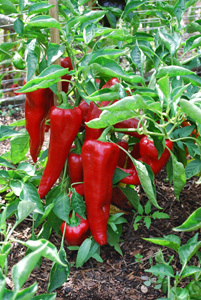 'Faher Ozon' peppers are stunning in the landscape, with their 5-6" (13-15 cm) peppers pointing skyward from the plant. 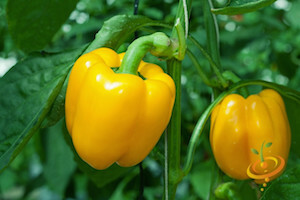 Peppers ripen from creme-colored to a deep orange, and have a little heat. Plants are short and compact so tighten spacing when planting. ‘Round of Hungary’ (Heirloom, Open Pollinated, 55 days to green, 75 days to red ripe) produces produce flattened, heavily ribbed, thick-walled fruit that ripen to red more quickly than most pimiento peppers. 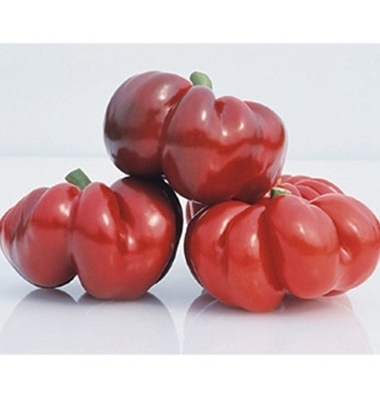 Excellent for roasting, stuffing, or drying for paprika. ‘Carmen’ (F1 hybrid, 60 days to green, 80 days to ripe red) is a ‘corno di toro’ (bull’s horn) pepper that produces 6” x 2 ½” (15 x 6cm) long peppers. 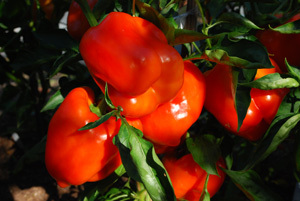 One of the sweetest Italian frying peppers. Excellent for frying, roasting, grilling, or stuffing. 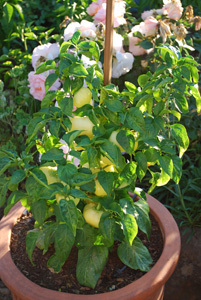 The plants produce early, even in cool-summer gardens. 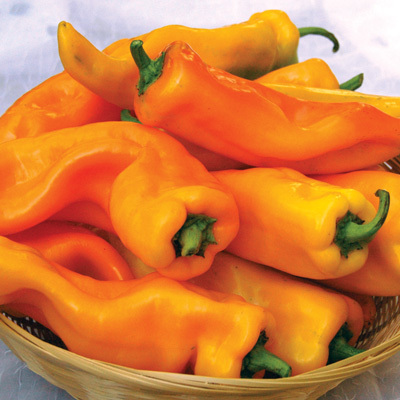 'Gatherer's Gold' (Open Pollinated, 70 days) produces beautiful, golden Marconi frying peppers that are sweet, crunchy, and have few seeds. Excellent flavor raw or fried. 'Jimmy Nardello' (Heirloom, Open Pollinated, 70 days to red ripe) is an Italian heirloom frying pepper that's a local favorite in the San Francisco Bay Area. 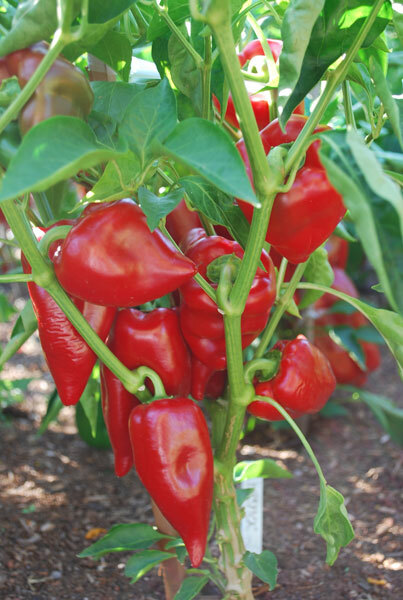 It produces an abundance of long, thin, wrinkled peppers that are sweet and fruity, with citrus overtones. Delicious raw right off the bush, but they're traditionally fried in olive oil. 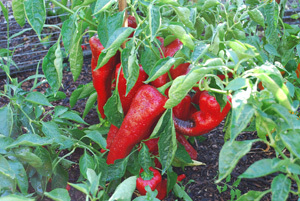 ‘Italian Pepperoncini’ (Heirloom, 75 days) is the classic Italian heirloom pickling pepper. 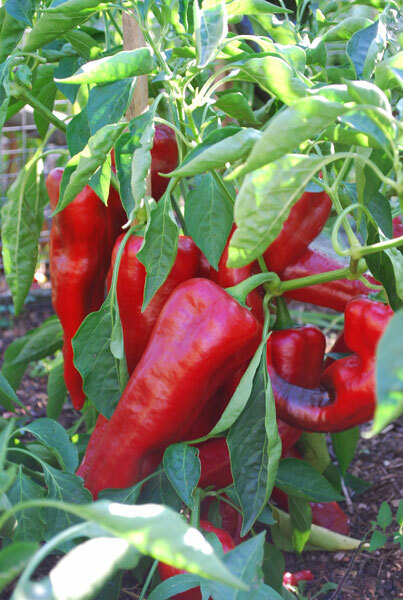 Peppers ripen from yellow to bright red in the fall, and sweeten considerably as they ripen. Excellent eaten fresh and raw or pickled.